Smartscan Ltd, a British company focused on machinery safety systems and machine safety products was founded in 1987 and is now a leading UK manufacturer of machine safety products for machinery safeguarding applications. Smartscan has continued to grow the business and now has its own company representation in both the USA and Taiwan. Our staff and distributors have a broad range of experience within the industrial machinery safety market and deal with a range of standard and specialist applications on a daily basis. Together with our ISO 9001:2008 certification, full confidence can be placed in the quality, reliability and above all the safety of Smartscan solutions and equipment. 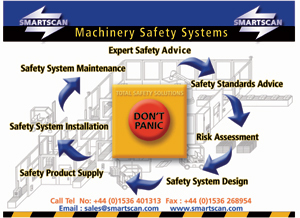 Smartscan provide help right through the machine safety process from initial expert safety advice through safety standards advice, risk assessment, safety system design, safety product supply, and safety system installation to safety system maintenance. In addition our safety consultancy service also provides bespoke machine safety training and CE marking services for machines, including Declaration of Conformity and Technical File in accordance with the Machinery and other associated Directives. Safety light curtains, safety gate interlocks, safety relays, and safety PLCs, plus a range of accessories including control panels, mounting stands, mirror systems, beacons and many other items. Smartscan are the originators of the fully integrated 'L' and inverted 'T' shape safety light curtain to address the special safeguarding needs that arise with end-of-line packaging environments, specifically around the pallet entry and entry/exit zones, across conveyors. Over the years we have been involved in a great variety of machine safety applications which we have worked together with our customers to develop a particular specialist solution. Our customers rely on us not only to provide standard off the shelf solutions but also to take on and solve demanding application problems e.g. Hot metal forging and cold store environments. To provide its customers with cost effective machinery safety products and solutions through innovative customer driven designs. Our products and solutions are used in a great variety of industrial sectors including, canning, brewing/distillers, food processing, bakeries, paper products, bottling/soft drinks, building materials, dairies, textiles, pet food, tyre manufacturers, medical / pharmaceutical, film processing, retail distribution, electrical assembly, cosmetic industry, metal forming and bending, automation and robotics and many more. The factory and offices are sited on a 1.4 acre freehold site. The purpose built factory was completed in 1989 and provides 12000 square feet of floor space, 6000 square feet of which is dedicated to manufacturing. The site also acts as Head Office from which the Research and Development, Sales and Marketing and Service are conducted. The factory and offices are sited on a 1.4 acre freehold site. The purpose built factory was completed in 1989 and provides 12000 square feet of floor space, 6000 square feet of which is dedicated to manufacturing. Smartscan is based in Corby, Northamptonshire, England. This central location is served by a major trunk road network and is within eight miles of the A14 – the east to west link between the A1 and M1/M6 junctions. Click here for map and directions. Australia, Austria, Belgium, Denmark, Germany, India, Ireland, Italy, Mexico, Netherlands, New Zealand, Norway, Poland, Portugal, Spain, Sweden, Switzerland, Taiwan, UK and USA.